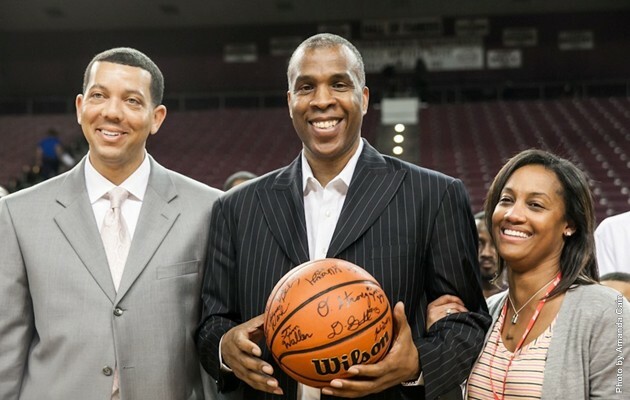 HOUSTON – On a night in which Texas Southern head men’s basketball coach Mike Davis secured his 250th career victory TSU’s Fred Sturdivant led the charge with a impressive performance scoring 21 points and grabbing 17 rebounds. Texas Southern won its eighth consecutive game defeating MVSU 73-57 at home. Ray Penn scored 14 points and Aaron Clayborn added 10 for the TSU (13-14, 12-2 SWAC). Texas Southern trailed 12-11 with just over 13 minutes to play in the first half, but took the lead for good on a Penn jump shot that ignited a 12-0 TSU scoring run. The Tigers outscored Mississippi Valley State 24-4 after that basket as they went on to subsequently take a 35-18 advantage into the break. Texas Southern’s defense held MVSU to five field goals in the first half as Mississippi Valley State shot only 17 percent from the field. The second half brought about more Texas Southern dominance as the Tigers got a lot of open looks and easy buckets in transition. TSU outrebounded MVSU 34-32 and held Mississippi Valley State to shooting just 32 percent from the floor for the game. Sturdivant was the catalyst for the Tigers defense as he was a menace to MVSU’s offense the entire night blocking a total of eight shot attempts. Sturdivant was the only player for either team to hit the double digit mark in rebounds. TSU dominated inside the paint outscoring MVSU 46-28 while racking up 16 points in transition. The Texas Southern Tigers travel to Alabama for their final road swing of the season as they will face Alabama A&M (Feb. 23) and Alabama State (Feb. 25). TSU will return home on February 28 for a meeting with the Southern Jaguars. Texas Southern Mike Davis won his 250th career game with TSU’s win over Mississippi Valley State. TSU won their eighth consecutive outing and kept pace in the SWAC regular season title race. Fred Sturdivant’s eight block shots was the most rejections by a SWAC player in a single game this season. Sturdivant’s 17 rebounds tied the SWAC regular season high for rebounds in a single game. Omar Strong made a three point basket for the 59th consecutive game which is the longest current active streak in the NCAA.